Belleek picture frame features the Tara design that is enhance with hand painted shamrocks and Celtic knots. 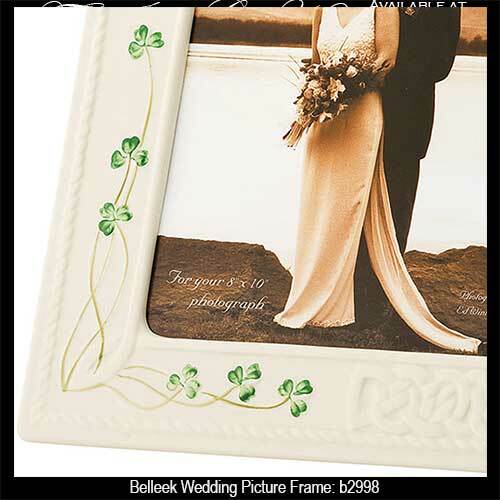 Please note that this wedding photo frame ships directly to you from Belleek's east coast facility in the United States. Typical delivery is in 5 - 7 days by ground delivery. This fine china Irish frame features embossed Celtic knot-work along with hand painted green shamrocks. The Belleek picture frame is an ideal wedding gift that measures 11" wide x 13" tall and holds an 8" wide x 10" tall photo; it is ready to stand with the attached easel. 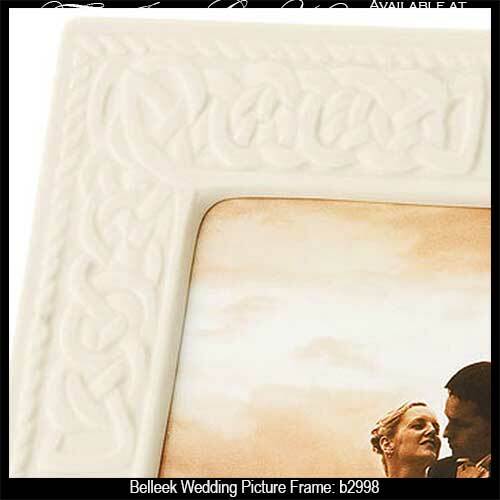 The wedding picture frame is handmade and hand-painted in Belleek, Ireland and it is gift boxed with Celtic knot and shamrock history cards, complements of The Irish Gift House.